Suddenly the world is beating a path to our door! Have you seen the film ‘The Water Diviner’ yet, starring Russell Crowe? I gather it has had mixed reviews, but it’s about an Australian farmer who travels to Turkey after the Battle of Gallipoli to trace the bodies of his three missing sons. And he uses his water divining skills to find them. So now, everyone is asking ‘What is a water diviner?’ and, being water diviners, our President Peter Golding, and our speaker on Thursday 9th April, John Baker, have both been contacted by the newspapers wanting to know more about dowsing. John spoke about various dowsing jobs he had done in Essex and Kent where he lives. In rural Gloucestershire, Peter Golding is mostly asked to find water for borehole sites for farmers, whereas in parts of the south-east, you are no longer allowed to sink a borehole because of water shortages. John is most frequently asked to find leaks on a commercial scale at places such as Millwall Football Ground, Dulwich College, and ancient industrial estates where there is no plan to show where pipes had been laid years ago. John’s other speciality is dowsing for wells. Anyone with a property older than the 1920s is likely to have at least one well on their property, possibly more if the first one had become contaminated or run dry. Capped and abandoned wells can be dangerous - beware! After the talk, we invited the Sunday Telegraph reporter and photographer to the field behind Slimbridge Church where John demonstrated how to dowse for water. They were fascinated, and their report appeared on the Telegraph website on 12th April. John Baker introduces reporter William Langley (left) to dowsing. 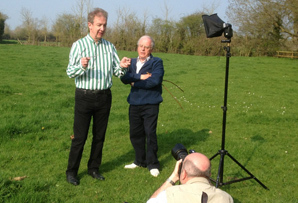 Photographer Christopher Jones records the moment for the Sunday Telegraph website. John’s experiences show that dowsing can be used in a variety of ways. We can ask our rods to find water, archaeological ruins, earth energies, even health problems. So for the film ‘The Water Diviner’, it does make sense that the Australian farmer could use his dowsing skills to find the bodies of his sons. Showing at a cinema near you. 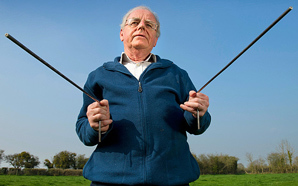 Come and see us in action on Monday 4th May at Slimbridge Wildfowl & Wetlands Trust on International Dowsing Day.